Overnight I noticed that the bike was sitting too far over on the sidestand. Closer inspection showed that it had lost a fixing bolt and the other was almost unscrewed. I rummaged around and found a similar one and bodged it back together. I phoned Allan, the guy we were going to visit in Corpus Cristi and he also tried to find one. As an ex motorcycle dealer, he knew all the likely places to get one. At out usual 11am we set off on the San Antonio ring road and spurred off Southeast towards Corpus Cristi. Allan had given us a more picturesque route to take to avoid most of the interstate and when we arrived at a place called Refugio we saw Allan filling up his Super Tenere (just like Wallace) at the Shell petrol station. 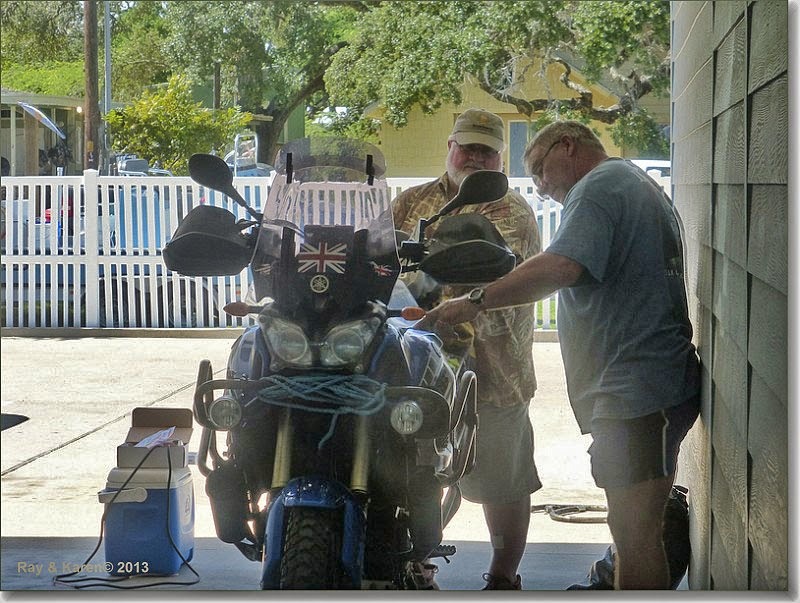 He wasn't hard to identify, he is the only one in South Texas with a blue Tenere. It was great to meet up after corresponding on the internet for a couple of years. Allan had arranged and paid for a motel for us for 3 days at the small coastal resort Fulton, near Corpus Cristi. This from a man we had never actually met. As I previously said, these Americans are just unbelievable people. We filled up too and then went into the burger joint beside the petrol station for a much needed drink. Allan was a delight. We chatted like we had properly known each other for years. After an hour off gassing, we got on our bikes and headed off for Fulton. The roads were straight (no change there then) and Allan made full use of them. It was like being on a race track. We usually ride at about 55-60 mph. We were now screeching along at 90 and over the ton when overtaking startled motorists. It was a lot of fun actually and a nice change from the mundane drone at 60. Fortunately Allan had a radar detector on his bike to ward off any evil spirits. We arrived at the motel and went out for a bite to eat at a local restaurant. Allan's Tenere, even the plate says Tenere. Allan Pagan, who is about the same age as me, uses the motorcycle forum name of Dallara, (which is the Italian race car chassis manufacturer,) has had an interesting past. This is the short version as I understand it. He started out life as a motorcycle mechanic and gradually worked his way up to owning motorcycle and car dealerships. During this period he had a passion for motocross racing and worked hias way up to national level. Sadly, as is often the case, motocross played havoc with Allan's leg joints and he suffers for it now. Latterly, Allan and his father formed an Indianapolis race team and raced as Pagan Racing. In the mid 1990's raced with more than respectable results with 2 second places using Roberto Guerrero as their driver. Allan is an extremely intelligent guy and over the course of two days, we managed to bore Karen almost to death talking about bikes and engines. Allan took us, all around the local area showing us the local points of interest and restaurants and we just clicked. It was a truly wonderful and informative couple of days and we will not forget them. Over here the government has shut down. That means that all the National Parks are closed and it is quite strange for us to understand. There is a lot more to it, but basically it is down to both parties reaching a stale-mate over "Obamacare", which is to do with health care. It's a bit like watching our politicians squabbling with each other. Other bits of news, are more to do with the weather. We are enjoying the heat here, but places we were in only 6 weeks ago, are under feet of snow and one of the storms at the moment is Tropical storm 'Karen', which is buzzing about in the Gulf of Mexico, instead of just on the back of the bike, trying to keep Ray on the straight and narrow! A local celebrity, a 1000 year old Oak. One of the 2 oil rigs in the harbour being renovated. The oil spillage boat. Used when BP had their spillage in the Gulf of Mexico. Allan took us to a aircraft carrier museum, the USS Lexington. A US Skyhawk, like the ones used by the Argentinians in the Falklands. An F4 Phantom. One of my favourite planes. A radial engine as used in many WW2 aircraft including the B17 Flying Fortress. Allan has a Cadillac CTS-V sedan which is a nice family saloon. He took us out towards a National Park and on the way happened to drop into conversation that the car was quite quick. He then overtook several cars at once like they were parked and backed off at 150mph. Once a racer, always a racer ! (if any police officers are reading this - I am joking !). It turns out that the car will do 1/4 mile quicker than Wallace and is speed limited to 186mph. Karen doing her bird thing again. A humming bird. Allan helping me fine tune Wallace. The Fulton Inn, where we stayed. More Karen playing with the camera. A couple of permanent grins... Chillin' by the bay. Sunset away from the sun...and..
On Saturday, we drove out onto the harbour at Fulton and just drank and talked overlooking the bay, whilst listening to a local music festival and watching the sun go down. It was peaceful, serene and just plain nice. We set off at the usual time and rode down to McAllum on the Mexican border. It had rained this morning and the temperature was quite a bit cooler than we have had recently. We intended to stop at a place called Raymondsville and watch the hurricane Karen wander past overhead whilst eating a bit of lunch. Sadly, Raymondsville was a dying town and there was nowhere appropriate to eat so we just pressed on and arrived at McAllum at 3pm. We booked into the Best Western and waited for Allan to pick us up. He had traveled down to see his girlfriend Vikki who is a trainee anesthetist nearby. They arrived at 5:30 and we met Vikki for the first time. She was delightful and it is was easy to see why they were together. We went for dinner and had a great evening and sadly we had to finish early. It was a sad parting with many promises of future contact. The pair of them are some of the worlds most beautiful people and we are privileged to have met them. From my point of view, I was not bored by all the motor cycle talk. I found Allan a very intelligent and interesting conversationalist. You have really spoiled us these last few days and I can't thank you enough for that. Till we meet again. I can't believe that 6 months are up, but they couldn't have finished on a better high. I personally would like to thank all of the wonderful people we have met on this part of the adventure, you have all made it so much more memorable, and dragged us back, when we were in danger of thinking we might have taken on a bit too much. God bless and we will be in touch soon.